Vitamin B12 (in addition to other B vitamins) plays a super important role in our health — particularly in the production of our red blood cells and the well-being of our central nervous system. The rate of vitamin b12 deficiency is on the rise, leading to a subsequent increase in vitamin b12 supplementation. B12 is a particularly "hot topic" (as hot as vitamins can get!) in the vegan community. Since this vitamin is only available in animal products (not bioavailable in plants), many vegans and vegetarians have resorted to supplementing with synthetic forms of b12 to maintain health. 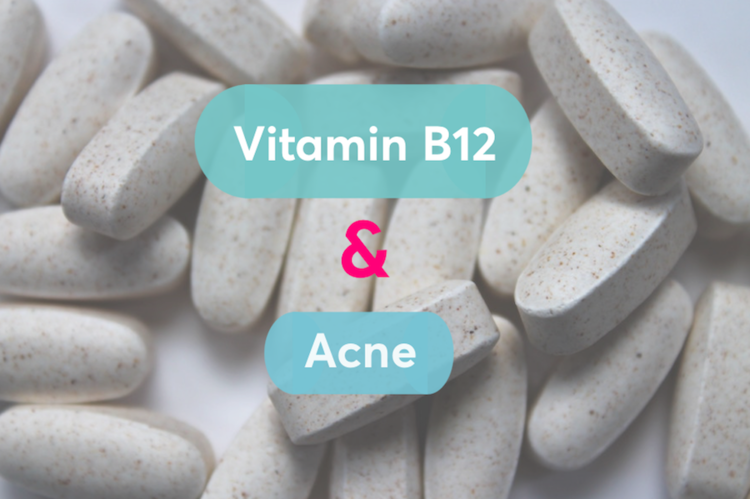 Ironically, there is some speculation (dating as early as the 1950's) that Vitamin b12 supplements may actually contribute to the onset or worsening of certain health issues including acne breakouts. One particular study from UCLA (University of California, Los Angeles)found that vitamin B12 actually changed the gene expression of skin bacteria, which could potentially lead to acne-promoting inflammation—yikes! In this study, a population of people without acne were observed before and after receiving a B12 injection. 1 out of the 10 participants in the study experienced a breakout following the injection. Researchers also found that this individual's gene-expression pattern also changed. Before the B12 injections, their gene expression was similar to those of the other healthy participants, but 14 days after the vitamin B12 shot, it looked much more like an acne patient's —crazy! The researchers also did experiments on the p. acnes (Propionibacterium acnes) bacteria in the lab. They found that when they added B12 to the bacteria in a lab dish, the microbes started promoting compounds called porphyrins, which are known to promote inflammation. While the research done at UCLA is certainly interesting, it's important to note that this was just 1 study on a small group of individuals. Additionally, the doses of B12 administered to the participants was very large via Vitamin b12 injection—much more than the average supplement available over the counter. Therefore, it's simply too early to prove Vitamin B12 actually causes acne — much less advise that people with acne should stop taking B12 altogether. That being said, if you have acne and are looking to achieve clear skin, take a look at your supplements and make sure you're not getting too much of any one thing. One way to determine whether you should take vitamin b12 is to get a blood test. If you are not deficient in vitamin b12, talk to your doctor about stopping any additional B12 supplements and take note of any effect on your skin.